FREE ESTIMATE. To buy, auction, sell or consign your Arthur Rostron autograph that is for sale, please email Nate@NateDSanders.com or call the Nate D. Sanders Auction House (http://www.NateDSanders.com) office at (310) 440-2982. Sir Arthur Rostron was the captain of the RMS Carpathia, the ship that rescued survivors of the RMS Titanic. The Carpathia was traveling between New York and Croatia when they received news that the Titanic had struck an iceberg. Captain Rostron is known for tirelessly attempting to make it to the Titanic before sinking. The Carpathia was about 58 miles away, and despite traveling at full speed toward the disaster, he wasn’t able to make it to the Titanic until 3.5 hours later. Captain Rostron received a Congressional Gold Medal for his life saving efforts. We have sold two Arthur Rostron autographed items at auction. Lot details are below. Very Scarce RMS Carpathia Captain Arthur Rostron Handwritten Letter — While on That Ship Just One Month Before He Rescued the Titanic! Scarce autograph letter signed by Captain Arthur Rostron of the RMS Carpathia, the famed ship that rescued nearly half of the Titanic survivors. This letter is especially unique as it’s dated one month before the wreck of the Titanic. Datelined “R.M.S. Carpathia / N.Y. 3-6-12 / 10am”, letter reads in full, “Dear Sir: Just a line to thank you for your letter – I am really very busy two minutes even to myself. Yours truly, A.H. Rostron.” Letter is written upon a 5.5″ x 3.5″ card. Writing is still bold, overall in near fine condition. Sold for $2,013. 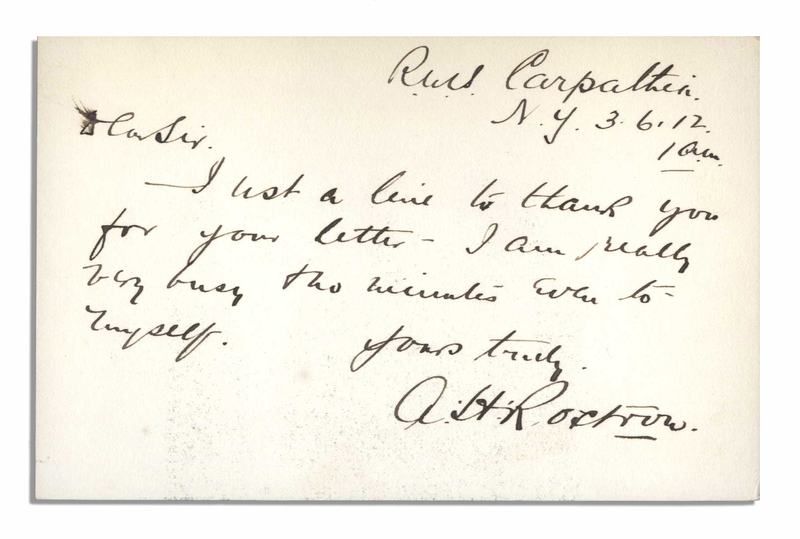 Very Scarce RMS Carpathia Captain Arthur Rostron Handwritten Letter. Click to enlarge. 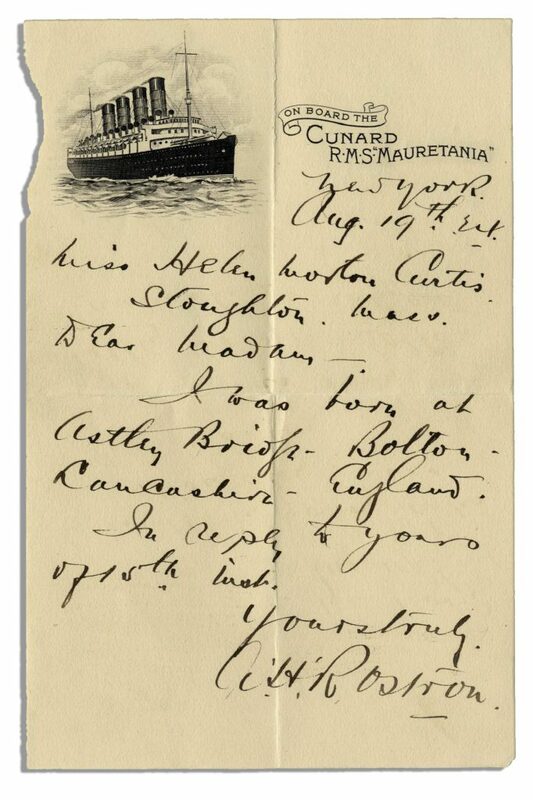 Captain Arthur Rostron autograph letter signed on ”Cunard R.M.S. Mauretania” stationery, dated 19 August from New York. Rostron was Captain of the ocean liner RMS Carpathia when it rescued the survivors of the Titanic which fatefully sank on 15 April 1912. Letter is addressed to a Miss Helen Curtis of Stoughton, Massachusetts, giving biographical information which she asked for. Signed ”A.H. Rostron”. One page letter in bold, black ink measures 4.5” x 7”. Intersecting folds and a slightly uneven left edge. Pencil notations to verso in an unknown hand. Very good condition. Sold for $750. Titanic Rescuing Captain Arthur Rostron Autograph Letter Signed. Click to enlarge.